No one wants acne. The common, unsightly skin blemishes can cause a huge amount of discomfort as well as an obvious hit to self esteem. Acne is caused by infected sebaceous glands. They tend to become over stimulated in the teenage years explaining why acne is so prevalent in adolescents. The glands located under the skin are connected via small canals known as follicles. Pimples form under these follicles when they become blocked, causing an oil known as Sebum to accumulate under the skin. Acne is a skin condition caused by the blockage of oil glands found at the base of hair follicles. The most common time to experience acne is while going through puberty. Acne is not a dangerous condition, but can leave facial scarring. Acne comes in many forms including whiteheads, blackheads, papules, pustules, nodules and cysts. Over 75% of teenagers develop some form of acne whilst going through puberty. Acne can affect people of all ages, although this is uncommon and is normally as a result of a poor diet. Acne can be passed through genetics, although this is not always the case. External factors such as anxiety and stress can play a role in the development of acne. 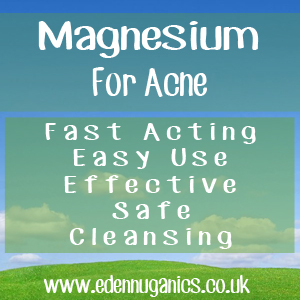 How can magnesium help my Acne? Magnesium is a dietary mineral found in every cell, although most is stored in our bones. It plays a role in over 300 enzymatic reactions within the body. Many of these relate to energy, however, there is growing evidence to suggest that Magnesium can be used as a powerful tool in the fight against acne. It helps to produce a substance known as collagen that protects and repairs our skin as well as protecting DNA at a cellular level. Magnesium can also restore hormonal balance by regulating biochemical processes which in turn helps to reduce Sebum excretion. There are a large selection of magnesium salts that can be taken as supplements. Common varieties include the chloride, citrate, carbonate, bicarbonate, sulphate and oxide type of the mineral. One of the more commonly used treatments is a transdermal topical spray made by mixing magnesium chloride with distilled water. This can be applied directly to the problem areas and many people claim to have seen dramatic improvements in a matter of days. Magnesium can also be effectively used as an internal supplement. For this we recommend trying magnesium citrate, however it's best to take this 1 - 2 hours before a meal as it has an alkalising effect on the stomach that could lead to digestion issues. There is no lab test able to offer a truly accurate reading of the magnesium levels in your blood. Around one percent of magnesium found in your body is distributed in your blood, making a sample of magnesium from a blood test highly inaccurate. Other tests that your doctor can use to evaluate your magnesium status include a 24-hour urine test, or a sub-lingual epithelial test. Magnesium Acne Connection? Does Magnesium Deficiency Cause Acne?